If you have finally given in to your kids and are soon to be introducing a four-legged canine member to the family, this article was written with you in mind. Assuming that you have weighed up all the pros and cons, and fully understand the responsibilities that come with dog ownership, there is much to arrange prior to the puppy’s arrival. Collar & Leash – Preferably with a tag that has his name and your phone number. The collar should be of the right size for the breed, and he can wear this as he grows, as it will be adjustable to a point. 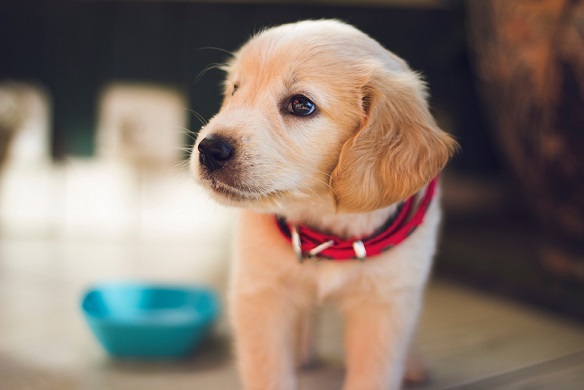 The leash is an essential item and it should always be hung in the same place; next to the back door is an ideal location, and the puppy will very soon associate the leash with going out. Food & Drink Bowls – He should have how very own food and water bowl, which should be kept in the kitchen, near his bed. Water should always be available, and cleaning the bowl daily will reduce the risk of a germ infection. Bedding – It might be a large cushion, or a blanket folded up, but your puppy does need to have his own space, where he will spend the majority of his time. A few soft toys would be a good idea, and perhaps something he can chew, which might save your shoes. Pet Insurance – You are advised to take out some form of pet insurance, which would cover you in the event of an emergency. There are several pet insurance policies, ranging from basic cover right up to a fully comprehensive policy that will cover most of your vet bills. An online search will take you to Australia’s leading pet insurance broker, and once you select your chosen policy, a secure online payment will see your pet covered. The First Visit to the Vet – This should be within the first week, and the vet would administer certain vaccinations on that date, while scheduling others on future dates. You will also need to have the puppy microchipped, which will really help if ever he gets lost. The vet is the person to ask if you are unsure about the puppy’s dietary and exercise needs, while you can also find a lot of information online. The family needs to get together before the puppy’s arrival to decide on a few ground rules; what he can and cannot do, and once the rules have been established, everyone needs to be consistent with their behaviour. This will help the puppy to figure out what is can do and what he cannot, and with a little training, he will soon fit in with family life. When the day finally arrives to bring him home, your new pet will become an important part of the family, and with the right training, he will bring a lot of pleasure to all the family.